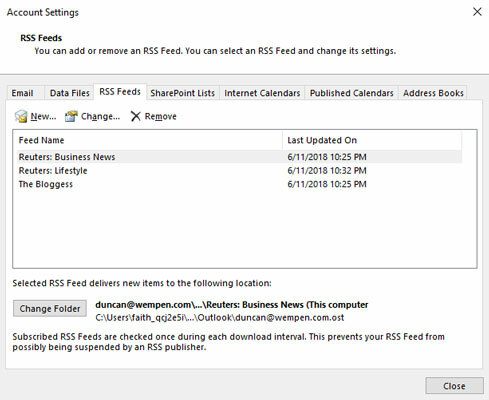 You can set up an RSS feed of any type using either Internet Explorer or Microsoft Outlook 2019, and then read them in either place. However, if you are subscribing to a podcast, you might want to use the Outlook method, so you can configure the feed’s settings while you’re at it. 1. Click the File tab, click the Account Settings button, and then choose Account Settings from its menu. The Account Settings dialog box opens. The RSS signup page shows the list of feeds to which you’ve subscribed. The Account Settings dialog box. The New RSS Feed dialog box opens, as shown here. The New RSS Feed dialog box. Go to the site where the feed you want is hosted. Right-click on the XML, RSS, or Feed button. Different sites use different names for the same thing, but it’s often an orange button or a button that looks like the wireless networking icon in the notification area. 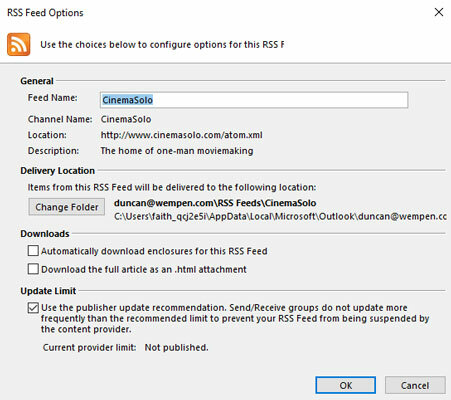 After you’ve done that, you can follow the preceding steps and paste the address into the New RSS Feed dialog box. Feed Name: You can change the name that Outlook displays. Some feeds have long, clumsy names. Delivery Location: Some feeds generate huge amounts of information, so you may want to send that information to a special folder or even to a totally separate data file. That can be particularly true for podcasts. If you’re on a big corporate network that limits the amount of email you’re allowed to store, you may want to send your RSS subscriptions to a separate Outlook data file to avoid running out of space. Downloads: Outlook automatically downloads only a brief summary of each item, which saves disk space but requires you to manually download the full text of each item one by one. When you’re subscribing to a podcast, it’s best to select the Automatically Download Enclosures for This RSS Feed check box so you receive the actual podcast file, along with the posting that describes it. Update Limit: Some RSS feed publishers don’t let you update your information too frequently. If you try to update too often, they cancel your subscription. If there’s a limit assigned to the feed you’ve chosen, this check box is automatically selected. The RSS Feed Options dialog box. As you can see, subscribing to an RSS feed (podcast, blog, or whatever) takes a few more steps in Outlook than it does in Internet Explorer, but you get more options. You can also subscribe to a feed through Internet Explorer and then go to Outlook’s RSS page, select that feed, and click the Change button to modify your options.